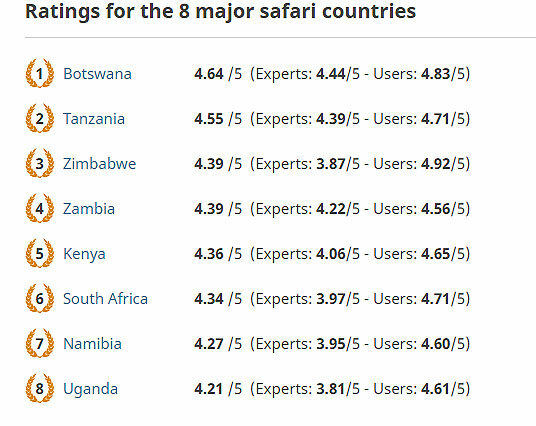 Zambia has ranked at number four of the most popular African countries for a safari vacation, according to a study released this week based on more than 3000 reviews on the dedicated safari site, SafariBookings.com. Top of the list, for the first time, is Botswana, followed closely by Tanzania. SafariBookings.com’s co-owner, Jeroen Beekwilder, a Dutch national, said they have sifted through many thousands of reviews on their website for an analysis based in part on user experience, and in part on expert opinion. In total, just over 2000 user reviews were included, complemented by slightly more than 1000 expert contributions. The reviews represent 85 nationalities. Twenty-two of the expert group comprise professional writers who specialise in safari guidebooks. “Our analysis determined that Botswana, although neck-to-neck with Tanzania for the continent’s best, was the finest country in Africa for going on safari. Given the exceptional wildlife-viewing opportunities in Botswana, a country that specializes in an exclusive safari experience, and luxury in the bush, this is understandable,” stated Beekwilder. The 2018 analysis is the third conducted by SafariBookings.com. In the previous two, Tanzania took the first spot. Although Botswana took the overall first spot this year, Tanzania still scored high in the sub-category for wildlife and scenic value. The analysis also revealed that Zimbabwe is making a comeback, taking the third overall position and scoring best in some sub-categories.